What are Addon Jet Ads? 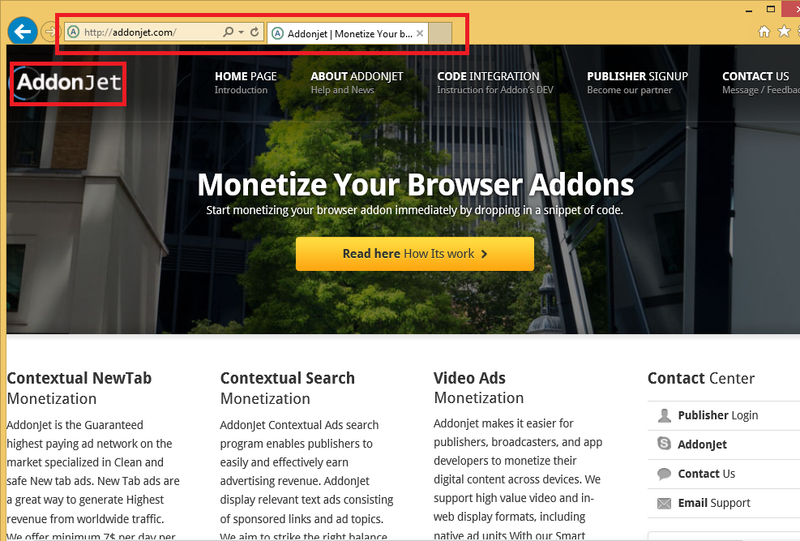 Addon Jet Ads appear in your browsers, because you have an advertising-supported program installed on your PC. Addon Jet is promoted as a utility that can help monetize free software by providing users with coupon ads, display ads, contextual search and new tab, video ads, in-text ads, and more. Unfortunately, for you as a computer user that is not beneficial at all. What it means is that you will be flooded with unnecessary commercial data no matter where you go online. We suggest that you get rid of Addon Jet Ads as soon as possible. How does Addon Jet work? Addon Jet adware gets distributed through free third party software bundles. You can acquire freeware from webpages like filewin.com, soft32.com, cnet.com, softonic.com, and similar. When you install software from these pages, you need to be especially careful, because it is usually accompanied by potentially unwanted apps. These apps are presented as additional offers and unless you decline these offers, they get installed automatically. You can and you should avoid that in the future. Potentially unwanted programs are rarely useful. In most cases, they flood you with ads or alter your browser settings. If you want to keep them away from your PC, you should always choose the Advanced installation mode and deselect all applications that are unfamiliar to you. The main symptom of Addon Jet is that it inserts ads into all of your browsers. It is compatible with all major browsers, so switching to a different one will not help you in any way. The adverts pop-up no matter where you go online. You should not click on them, because not all of them are trustworthy. If you click on fake ads, you will risk infecting your system with malicious programs, wasting your money, disclosing your private data, or dealing with other consequences of falling for a virtual scam. You should not take such unnecessary risks. The adware is also known to slow down Internet connection and computer speed. If you want to eliminate the unreliable data from your browsers and go back to swift and safe online surfing, you should terminate Addon Jet Ads right away. How to remove Addon Jet Ads? There are two ways you can erase Addon Jet Ads: manually or automatically. If you choose manual Addon Jet Ads removal, you will have to uninstall the adware from your PC and from your browser extensions. You are welcome to use the instructions presented below the article for further assistance. Alternatively, you can implement a malware removal and prevention tool from our site and delete Addon Jet Ads automatically. This option is more beneficial, because it allows you to not only eliminate Addon Jet Ads and other potential threats from your computer, but also to make sure that it stays clean and safeguarded from similar and more serious online infections in the future.